Public awareness of aging and its potential economic pitfalls varies across countries, but the view that aging is a major problem is more prevalent in countries whose populations are projected to be among the oldest in 2050, such as Japan, South Korea and Germany. People’s confidence in their ability to maintain an adequate standard of living in old age is related to how much the country’s population is expected to age and also to the country’s economic potential. Publics in countries with relatively young populations or emerging economies—Nigeria, Kenya, South Africa, China and Brazil—are among the most confident. The Japanese, meanwhile, are among the least confident, along with the Italians and Russians. When asked who bears the greatest responsibility for the economic well-being of the elderly, people are more likely to place the obligation on the family or the government than on the elderly themselves. South Koreans, Americans, Germans and the British are the only publics in which more than one-third say the elderly should bear the greatest responsibility for their own well-being. The government is the most common response in the majority of the countries that were surveyed. Of the 21 countries surveyed, at least half of the public in five countries says that aging is a major problem for their country. The populations in three of these countries—Japan, Germany and Spain—are already relatively old and continuing to age rapidly and, in the other two—South Korea and China–the populations are aging at a rate that will make them among the oldest by 2050. There is broad agreement on this question in Japan, where 87% of the public responded that aging is a major problem. The level of concern is also very high in South Korea (where 79% say aging is a major problem) and China (67%). This concern is expressed by 55% of Germans and 52% of the Spanish public as well. In seven countries, 40% to 50% of the public says that the growing numbers of older people is a major problem. The populations in these countries are mostly middle-aged to elderly, including in France, Britain, Russia, Italy, Israel and Argentina. The presence of Kenya in this company, where 47% say that aging is a major problem, is perhaps contrary to expectation—Kenya is among the countries with the youngest populations today and is projected to age little between now and 2050. The pessimism among Kenyans may be grounded more in current economic conditions than in future demographic realities. Americans, by and large, do not think that aging is a major problem for the U.S.—only 26% think that is the case. Likewise, only about one-in-four people in Nigeria, Indonesia and Egypt express the opinion that aging is a major problem. Generally, public anxiety over aging is higher in countries that are projected to have among the older populations in 2050. In Japan, South Korea, Germany and Spain, where concern about aging is among the most heightened, about one-third or more of the population is expected to be 65 and older by 2050. In China, the share of seniors is expected to nearly triple, from 8.3% in 2010 to 23.9% in 2050. At the other end of the scale, Egypt, Indonesia and Nigeria are projected to be among the countries with relatively young populations in 2050. In Nigeria, for example, only 3.8% of the population is expected to be 65 and older in 2050. The U.S. median age is increasing less rapidly than in most of the rest of the world and, by mid-century, its median age should look younger than that of several major European and Asian nations. In several countries, older people are more likely to think of aging as a major problem. The generational divide is most evident in countries where moderate proportions of the overall population think of aging as a major problem. 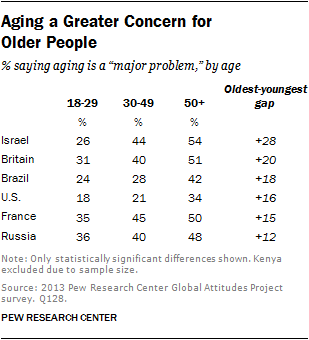 In Israel, for example, 43% of the public overall says aging is a major problem. But older adults (50 and older) are much gloomier: 54% of them say aging is a major problem, compared with 26% of adults ages 18 to 29. In the U.S., older adults are about twice as likely as young adults—34% vs. 18%—to say that aging is a major problem. A vast gap is evident in the degree of confidence people in different countries have in their ability to maintain an adequate standard of living in their old age. About 70% or more of the publics in China, Brazil, Nigeria, South Africa and Kenya are either very confident or somewhat confident of an adequate standard of living in old age. In this group, at least 40% of Nigerians and South Africans are very confident about their futures. Meanwhile, only about one-in-five Italians and Russians are confident about an adequate standard of living in their old age. The proportion climbs to one-in-three or a bit higher in Argentina, Egypt, France, Turkey and Japan. Americans (63%) are among the more confident, with 24% saying they are very confident regarding the adequacy of their living standards in old age and 39% saying they are somewhat confident. The level of confidence expressed by the public correlates with how much the country’s population is projected to age and with the health of the country’s economy. Generally, the older a country’s population is projected to be in mid-century, the less confident the public is about its standard of living in retirement. In Japan, where it is expected that 37% of the population will be 65 and older in 2050, 68% of people are not confident of the standard of living in their old age. At the other extreme, 6% of Kenyans are projected to be 65 and older in 2050, and only 28% of the people lack confidence in the standard of living they may have in their old age. It is worth noting that economic growth in recent years has slowed around the globe due to the Great Recession, which started in 2007. In the sample of countries included in this study, all but Indonesia and Argentina experienced slower annual growth from 2008 to 2012 compared with the growth they experienced from 2000 to 2007. Thus, the level of confidence people currently express about the standard of living in their old age may be lower than the long-term norm, and this confidence may rise in the future. Evidence for the U.S. shows that people had greater confidence about their retirement before the onset of the Great Recession. The Employee Benefit Research Institute has fielded its Retirement Confidence Survey since 1993. From inception through 2007, the survey typically found that about 70% of American workers were very or somewhat confident in having enough money for a comfortable retirement. However, since 2007, the share has dropped by about 20 percentage points. Pew Research Center surveys conducted in 2009 and 2012 found an 11 percentage point drop in the share of Americans saying they were very or somewhat confident that they will have enough income and assets to last through their retirement years.11 If past is prelude, Americans are likely to become more confident of their future in retirement as the economy rebounds. In several countries, younger adults, ages 18-29, and adults 50 and older express different levels of confidence about their standards of living in old age. In countries with older populations, notably Japan, Germany, Italy and Britain, the younger adults are much less confident. In Japan, 42% of people ages 50 and older are confident of their standard of living in old age, but only 22% of people ages 18 to 29 say they are confident of the same. The opposite holds true in countries with younger populations, such as in Nigeria, Indonesia and South Africa. 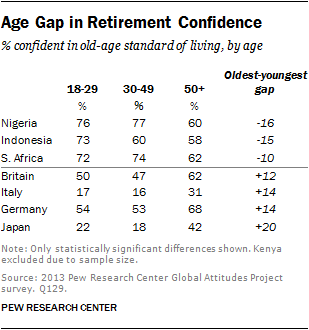 In Nigeria, the high level of confidence overall is driven by young adults. Some 76% of Nigerians ages 18 to 29 are confident of their future, compared with 60% of those ages 50 and older. A rosy outlook in general is related to confidence in one’s future economic well-being. The Pew Research survey included questions on how people view the current economic situation for themselves and for the country, and whether they are positive about their children’s futures.12 Is confidence in these matters related to the confidence people have about the standard of living they may enjoy in their own old age? The answer, not surprisingly, is yes—people who are more positive about present-day economic circumstances or future economic circumstances for their children are also more confident about their own futures. People who say their personal economic situation today is good are more likely to say that they are confident of their old-age standard of living. In Germany, for example, 70% of those who say their personal economic situation today is good are also confident of their future standard of living. However, only 25% of Germans who say their personal economic situation today is bad are confident of their future standard of living, a differential of 45 percentage points. A similar differential exists in the U.S. Some 77% of Americans who say their personal economic situation is good are confident in their economic future. In contrast, only 36% of Americans who say their personal economic situation is bad are confident of their future standard of living, a differential of 41 percentage points.13 In most of the countries that were polled, the differential is 20 percentage points or higher. There is also an association between positive views of the country’s economic situation today and faith in one’s own future. In Israel, 57% of those who say the country’s economic situation is good are also confident of their standard of living in the retirement years.14 But this level of confidence drops to 30% among Israelis who say the country’s present economic situation is bad, a differential of 27 percentage points. A differential of 20 percentage points or more also exists in Mexico, South Africa, Germany, South Korea, Japan and Britain. In the U.S., only 33% of the public say the country’s economic situation is good.15 In this group of people, 75% say they are confident of their standard of living in their old age. Among Americans who say the country’s economic situation is bad, only 58% are confident of their economic future, a differential of 17 percentage points. People who are confident of what the future holds for the country’s children are also more confident about their own future standard of living. In Israel, 41% of people overall are confident that they will have an adequate standard of living in their old age. But among Israelis who believe the country’s children will be better off than their parents when they grow up, 58% are also confident of their own future. In contrast, only 25% of Israelis who believe the country’s children will be worse off than their parents when they grow up are confident of their future well-being.16 This 33 percentage point differential is the largest among the countries that were polled. Likewise, sizable differences exist in Argentina, South Africa and Indonesia (between 26 and 27 percentage points) in the confidence people express in their own economic future depending on whether they say the country’s children will be better off than their parents. A differential of about 20 percentage points or higher exists in Spain, Britain, Kenya and Turkey. Who Should Take Care of the Elderly? In only a handful of countries does a sizable share of the public feel that the elderly bear the greatest responsibility for their own economic well-being. South Korea is the only country in which more than half (53%) assigns principal responsibility to the elderly. The U.S. (46%), Germany (41%) and Britain (39%) are the other countries in which more than one-third of the public points to the elderly. In most countries, only about one-in-ten people respond that the primary responsibility rests with the elderly. People are somewhat more likely to say that elderly care is a family responsibility. In seven countries, more than one-third of the public says such care is up to the family. Pakistan, where 77% respond that the family bears primary responsibility, is an outlier. About 30% to 40% of people in Brazil, Nigeria, Indonesia, Mexico, Japan and France name the family. In the remaining 14 countries, including the U.S., one-in-four or less of the public responds that the family is primarily responsible for taking care of its elderly. In most countries, the public is inclined to point to the government as the responsible party for the well-being of the elderly. That is the most popular response in 13 of the 21 countries, ranging as high as 63% in Russia. Clear majorities in Israel (61%), Kenya (59%), Italy (56%), Spain (55%) and Argentina (55%) also say that it is the government’s responsibility to take care of older people. People who name the government as the most responsible agent for the economic well-being of the elderly differ from those who name themselves or their families in at least one respect—they are apt to be less confident about their own standard of living in the future. This gap is most pronounced in Israel. Some 73% of Israelis who say they themselves or their families are responsible for the well-being of the elderly are confident they will have an adequate standard of living in their old age. However, among Israelis who believe the government has the greatest responsibility for the well-being of the elderly, only 29% are confident of their future well-being—a 44 percentage point differential. The confidence gap in the U.S. is also large—those who cite the government are 28 percentage points less likely than those who cite themselves or their families to say that they are confident of their standard of living in their old age.